All of my life, I have heard about the sacrifices men and women have made during wartime and deployment. This book does sound like it comes from a different perspective. One I suspect that is going to become even more common as time progresses, women in the actual areas of combat instead of in supportive roles. While I am sure it is an excellent book, I'm not sure I am ready for the level of emotion you have described. I will certainly have to choose the right time to read this book since it doesn't sound the least bit lighthearted or easy to read. Thanks for the great review and recommendation. Separation due to a military deployment is never easy on a couple or on their marriage. Add in the extra strain of worry if they are stationed in a dangerous combat area and the problems increase. 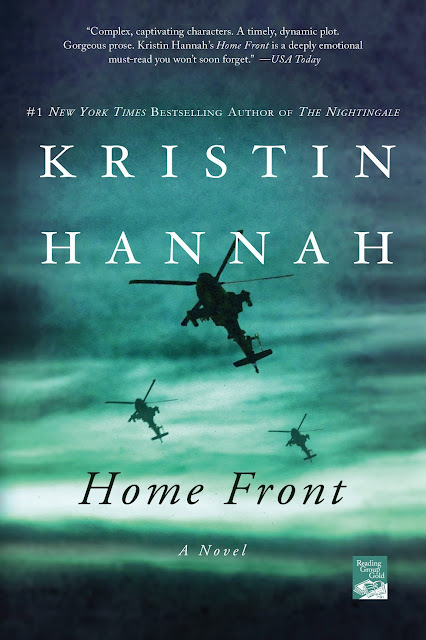 In the case of "Home Front", with the role reversal of the wife going off to war while the husband stays home with the family, I can see this story of relationships being very emotional and interesting. Thank you for your great book review, Brenda. You have certainly captured my interest with this review. I'm in the middle of another war novel right now and wish I'd picked some other book to start at the gym yesterday. I'm hoping the really gory parts are over. In general, I don't like reading about war because I usually read fiction to escape, but occasionally I do read a book like It is Well, How WWII Affected One Family, and it reminds me again of how ugly war really is and how it affects families who are left behind, as well as those fighting on the front. I gain understanding from this type of book, but I don't enjoy reading it because I see enough human misery in the world around me to want to seek it out while escaping. I occasionally read one and it does help me understand what others I may meet are going through when deployed or holding down the fort at home. We do live near an National Guard Base, one of my tenants is in Iraq, and his mother and brother rent our mobile home. So it's good for me to understand some of their unique problems related to deployment.